Feel like a child and see what show Microgaming has for you. You are invited to a 9 line show where you can meet different magicians and animals. Bring along a bite from this no download performance and try to see how a focus is made. 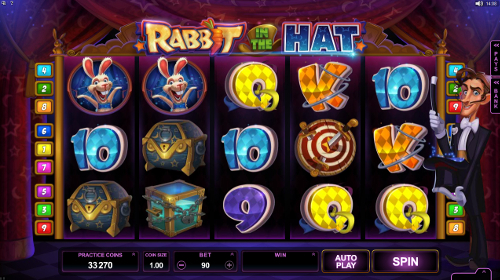 Get on a 5 reel ground of Rabbit in the Hat Slot Machine and become an apprentice following the master’s movements. Once you catch the illusionist taking out a rabbit from a secret compartment, consider yourself the owner of the wild symbol. The Magic Hat is now at your bidding, replacing all other icons to make your wins more probable. All Bonus Games are activated with the help of the wild symbol, so be sure you do your best to clear up its mystery. However, you are also welcome to try you lick hunting ice-age animals from Wooly World Slots. Ready to start the show? You are the boss, so choose any coin size ranging from $0.01 up to $1 to decide how much a ticket would be. To make the performance more bright and ferosh, put 10 coins per line and enjoy incoming prizes. The childish enthusiasm works magic, thus placing the max stake of $90, you enlarge your chances to receive great benefits. Only in such a way you can make it possible to win the top jackpot of the game, which in fact forms $50,000 for 5 icons of Magic Hat. On the top of the very right reel appear 4 different Hats, bringing their own rewards. Wanna activate them? Catch the wild symbol under each of them and enjoy a certain feature. Every time you make a spin, the Hat moves one reel left and if it reaches the last reel without the wild under it, it disappears. So, let’s see what we have. If you are lucky to trigger the Wild Reel Hat, it enlarges upon the reel turning up to 3 more wheels into wilds. Catching the Free Spins Hat brings you 10 Free Games and while you think it’s the only bonus here, it can be reactivated and reward you with up to 10 Free Spins again. 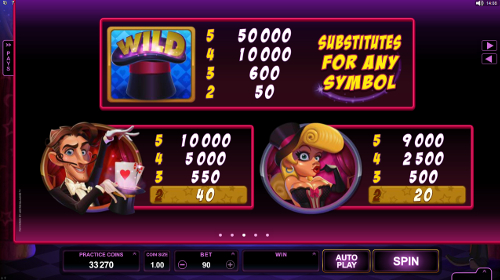 Cross your fingers and enjoy a random cash prize, hitting the wild icon under the Cash Hat. The result of this feature depends on your fortune only. Wait a min! What does that mean? It is the Mystery Hat Feature, which turns by chance into one of the Magic Hats prizes! 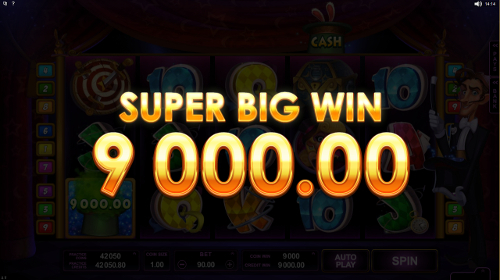 Experience this video slot and receive large winnings as easy as the magician gets the rabbits out of the barrel. Become a lucky one just loading the game and enjoying its various features and funny bunnies. 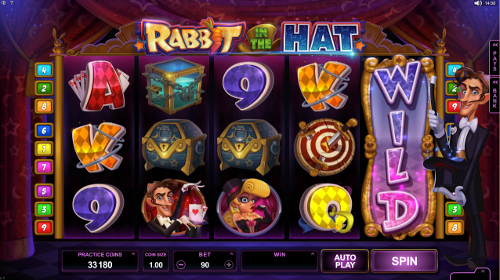 Rabbit in the Hat Slot Machine is ready to provide all these advantages for you. Why not seize this opportunity right now?